Fruit Fever Slot Machine - Casino Answers! Fruit Fever is a 5-reel, 18-line video slot developed by Espresso Games, featuring a wild symbol, scatter wins, multipliers, a free spins feature and a bonus game. You can play the Fruit Fever video slot at Bovada. Coin values on the Fruit Fever casino game are $0.10, $0.25, $1, $2 and $5. You can select up to 18 paylines and bet 1 to 5 coins on a spin in Fruit Fever. The maximum total bet available to play on the Fruit Fever slot machine is $450 per spin. This is a huge betting range that will give the casual players and high rollers exactly what they’re looking for. There are three different speed settings to choose from. To play the Fruit Fever video slot, select your bet and press the “Spin” button. You can also use “Bet Max” to play all 18 lines at 5 coins per line. The Wild symbol is the top-paying symbol on the Fruit Fever slot game. If you land five of these symbols on a selected payline, you can win up to the 1000 coin top jackpot. The Wild symbol substitutes for all other symbols in Fruit Fever, except for the scatter and bonus symbols. The next highest payout on the Fruit Fever slot machine is the Lemon symbol at up to 500 coins. Fruit Fever’s scatter symbol is the Fruit Plate. 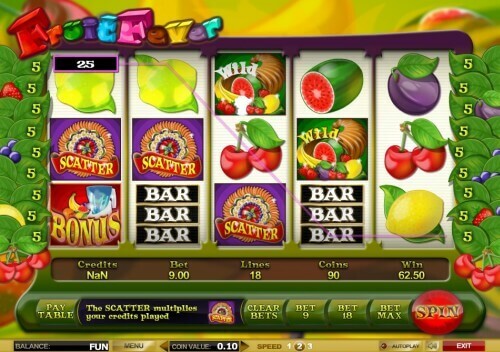 3, 4 or 5 Scatter symbols on the Fruit Fever slot game will get you a scatter win of 5X, 10X or 50X your total bet. When the Bonus symbol appears on the first and fifth reels, you will activate the Frappe bonus game. In the bonus game, you will choose three fruits to determine your free spins, multiplier and bonus win amount. You will get a multiplier and a bonus win for each free spin. You will receive at least 6 free spins or as much as 20 free spins at a 3X multiplier! You will surely get fruit fever after winning all of that free cash from this video slot at Bovada! Don’t want to stop playing Fruit Fever till you get that bonus game or hit that jackpot? The best way to do it is with the autoplay mode. Press the “Autoplay” button to select 10, 25, 50, 75, 100, 250, 500, 750 or 1000 autoplay spins. You can stop the autoplay mode at any time by hitting the “Stop” button next to the autoplay counter in Fruit Fever. Fruits and slot machines will forever be bonded. They are some of the most common symbols in slot machines – which are called fruit machines in the United Kingdom. You can get your own bond by winning tons of cash in Fruit Fever when you play it today at Bovada! Can American players play the Fruit Fever slot game for real money? No, American players cannot play Fruit Fever for real money at this time. Instead, play some USA-friendly fruit slot machines at Bovada Casino! Do I need to download any casino software to play Fruit Fever? 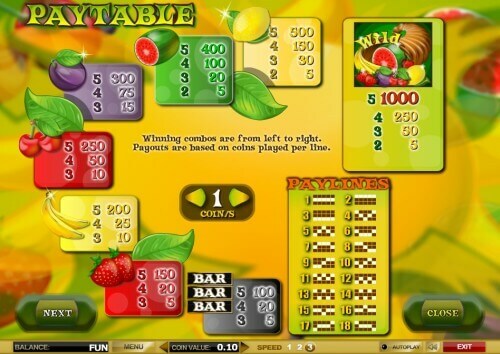 No, you can play the Fruit Fever online slot flash game in your browser for free or real money. Just make sure you have the latest edition of Adobe Flash Player installed on your computer.